Susuwatari (ススワタリ lit. meaning "travelling soot") are the "dust bunnies" or "soot sprites" first featured in My Neighbor Totoro as shy, slightly frightful creatures that live in abandoned buildings such as houses. They later reappeared in Spirited Away as workers in Kamaji's boiler room. They are small, black as soot and apparently fuzzy, with spherical bodies and two inquisitive eyes. They move by hovering around, but they can extend stick-like legs and arms from their bodies to do certain tasks, and can lift objects many times heavier than their own weight. They make a squeaky murmuring sound when excited, and dissolve into powder (soot) if crushed. In My Neighbour Totoro, the house the main characters move into is full of Susuwatari, which are rationalized as Makkuro Kurosuke (pitch-black blackie), an optical illusion caused by moving quickly from light into darkness. Later, the family drives the Susuwatari out of the house, as the home that was once abandoned is now inhabited. They would move to another abandoned area. In Spirited Away, the protagonist Sen (Chihiro) befriends a number of them by helping them carry coal. 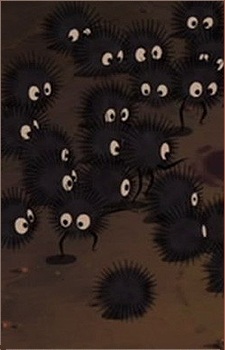 Sen is told that if these Susuwatari aren't given a job to do, they turn back into soot. Another character, Lin, feeds the Susuwatari much like farmers feed chickens, throwing handfuls of the Japanese candy Kompeito onto the ground for them to eat. The web is a hidden goldmine for anime cosplay and everyday wear. Is your wardrobe looking empty? Need some retail therapy in the shape of an anime skirt? Well, you've come to just the right place. Here are 15 anime skirt selections you can find and buy online, from the comfort of your home.